It might have reached 85 degrees today, but the signs of fall are here. 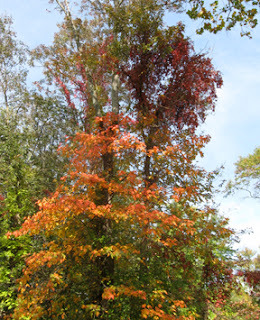 I have no idea what kind of tree this is, but the colors shifting from green to orange to red to green again made me want to bake pumpkin pie and drink apple cider. My friend was trying to catch one last glimpse of the turtles before it gets too cold, but they seem to have taken an early retirement. 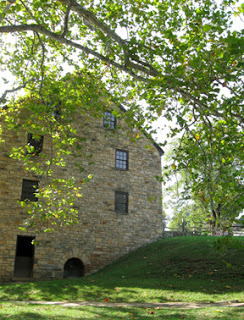 The late season rains we got last week mean George Washington's Grist Mill is ready to go for the fall harvest. This was the perfect afternoon for a picnic with friends to enjoy the changing season. I can't wait for all the trees to change colors and the fields to turn golden. This is one of the best times of year. Wow-- 85 degrees at this time of year? That's crazy! You didn't mention that when you went on your picnic, it was to Mount Vernon. I'm so jealous!